You’ve washed and rinsed your clothes by hand. Now they’re clean . . . and wet. The final step is making sure they dry sufficiently. A stretchy braided clothesline eliminates the need for clothespins. However, if you’re careful and considerate, you’ll be fine. Here are steps to making sure your clothes dry as quickly and as unobtrusively as possible. 1. After the final rinse, squeeze or wring each article as hard as you can to rid it of excess water. Then, one by one, roll up the laundry items in a bath towel or a pack towel to wick away as much of the remaining water as possible. Pack towels, made of microfiber, absorb several times their weight in fluid and are useful for many travel applications. Hang from the shower-curtain rod. Hang from your own lightweight wire hangers in the bathroom. Or bring inflatable hangers that puff up to a nice, fat size, enlarging the space inside garments so air circulation can aid the drying process. Hang over the tub on an elastic clothesline you’ve brought. It will probably have clips or suction cups or Velcro strips on either end. You can also make an impromptu clothesline from string, dental floss, or even fabric or elastic belts, although keeping your laundry from falling off such lines without clothespins might be a challenge. If the clothing has been wrung out so well there’s no possibility of drips, you can keep it out of sight by hanging it from hotel hangers in the closet. If you have access to an electric fan, aiming it at the damp clothing will greatly aid in its drying process no matter where it hangs. Coat racks, light fixtures, bedposts, or other room protrusions might also lend themselves to becoming passive clothes “dryers.” Just be certain not to ruin lampshades or varnished finishes by draping dripping laundry on them. Zap washed items with a hair dryer to evaporate some of the moisture. If your room is equipped with a forced-air heating-and-air-conditioning unit (often located under the window) you can take advantage of the feature by hanging laundry where blowing air will reach it. Again, taking your own wire hangers makes this easier. Unless your hotel room faces a dense forest or other geographical feature that gives you absolute assurance no one outside can see, resist the temptation to hang laundry from your window. You don’t want to raise the ire of the hotel manager. 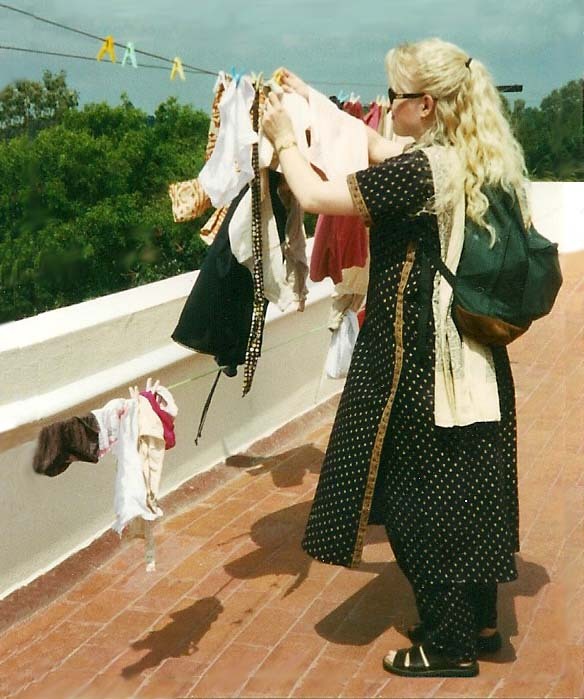 On the roof of a women’s college dorm in Bangalore, India, my daughter’s clothes dried in a very short time thanks to warm sunshine and a brisk breeze. 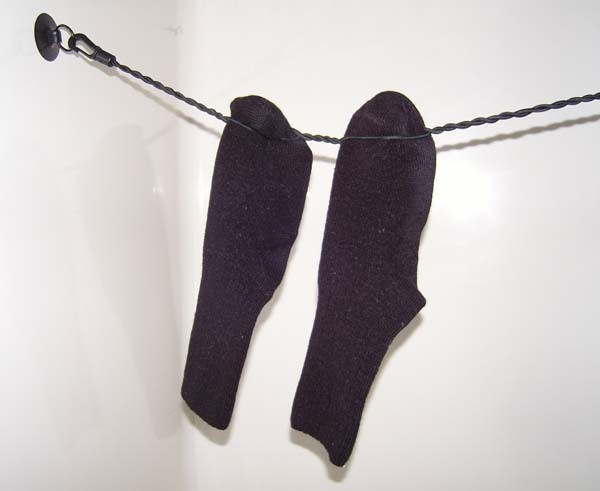 When staying at a private home or some type of rural institution that values solar-powered clothes-drying, you may be able to use your host’s clothesline. Rooftop clotheslines in sunny, breezy climates are wonderful for finishing the task in record time. If you’re driving a vehicle instead of relying on some other form of transportation, you might be able to take advantage of the car’s toasty interior space. Stick a suction-cup end of your elastic clothesline on the inside of a back passenger window and stretch the cord across to the opposite window. As the glass traps the sun’s rays—or the vehicle’s heater raises the inside temperature—your hanging laundry will release its moisture into the warm air. It would definitely be an advantage in this case if the car’s rear windows were tinted. Despite your best efforts, sometimes clothing will still be damp by the time you need to pack or wear it. If you pack wet items in a plastic bag, be sure to hang them up again as soon as you reach your new destination. You don’t want to have to rewash them to remove mildew. The best refreshment comes, however, from knowing you saved a bundle of money by washing your own clothes. You had few laundry expenses and no checked-luggage fees. And as a bonus, you’ll no doubt acquire many hilarious stories with which you can entertain fellow travelers as well as family back home. This entry was posted in Pennywise Packing Pointers and tagged carryon, cleaning tips, clothes, clothesline, creative solutions, frugal, laundry, liquids, packing, rinse, towel, tub, wash, washing. Bookmark the permalink.